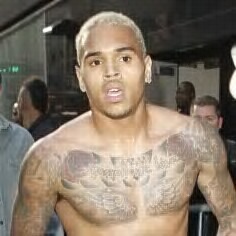 Chris Brown goes flipmode on GMA!!! Chris Brown exploded in rage behind the scenes at “Good Morning America” this morning smashing a window and storming out without a shirt according to TMZ. From what we’re hearing it was triggered by on-air questions about the Rihanna incident. Brown performed and was interviewed by Robin Roberts live from the Times Square studio when she began asking about the infamous incident. Brown tried to redirect the questions to focus on his album (F.A.M.E. which was released today), but Roberts continued to ask about Brown’s legal issues stemming from the Rihanna incident. We’re told after the interview, Brown freaked out, storming into his dressing room and screaming so loud, the people in hair and makeup became alarmed and called security. We’re told Brown was out of control, and smashed a window in his dressing room. Glass shattered and some shards fell onto 43rd and Broadway. ABC security told TMZ that the window was shattered with a chair. By the time security rushed the area, Brown had ripped off his shirt and left the building, blowing off another performance he was supposed to do for the ABC website. Sources say that on his way out of the building, Brown confronted a segment producer, got in his face and stared him down. People from the show got in between Chris and the producer to diffuse the situation. Wow Breezy! We’ve been rooting for you and we understand your frustration, but What the hell is REALLY going on!? I wish I had the courage to go off sometimes. I feel you Chris. Why is everyone constantly rehashing old bs? I heard once that all lawyers go to hell, well if that is true then reporters, paparazzi or whatever fit these two profiles will beat the lawyers. A reporter of today do not report anything except trash. They take all the negative of a situation and blow it up and we citizens help to make it work. I am praying for you Chris..please try to calm down though because you have too much to lose and I do not want to lose hearing your voice. You made a mistake, you paid for it , even Rihanna seems to have forgiven you and moved on so I understand why you do not understand why these so-called professionals can’t move forward also. I will pray for their dumb asses too. The guy’s a creep. He ruined his girlfriend’s face minutes before she was supposed to perform at the most important music event of the year. Why? Because she questioned him about cheating. 2 years later he gets violent when someone else asks him a question he doesn’t like. Sound familiar? Yup. He sounds like just another ordinary thug. The kind you stay away from if you’re smart. The kind that you don’t pay attention to OR BUY RECORDS FROM.